This is a black and white snapshot of Eugene Guagneli as a young child with his mother, Luisa Guagneli. They are at Niagara Falls leaning against the railing that looks out over the falls. Luisa is wearing a black fur coat over a white dress (or skirt and blouse outfit), with white tights and black shoes. A light coloured hat, possibly a cloche, completes her look. She is holding her son, Eugene, in a protective embrace. Eugene is standing on the rock against the railing. 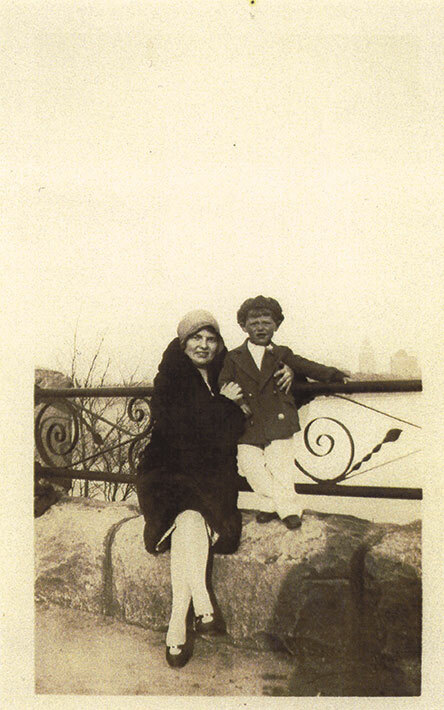 His right arm is resting against his mother's shoulder and the other arm is holding onto the railing. He is wearing a dark coloured coat with big buttons, a dark coloured newspaper boy cap, and black shoes. His white shirt has a high neck and his pants are also white. In the far background is a faint outline of a cityscape. It is wintertime as the bush that lines the railing is without any leaves.